This update is brought to you in bits…..when I get a spare half hour I write to all of you. If I did this all at once it would take me five hours or something near to that. I currently can’t spend to much focus on anything as my brain just can’t cope. It may be a bit of a roller coaster of how my life is at the moment which will give you a good indication of how I am and what my current had space is like. I hope this finds you all well…. Thursday 26th October, 2013 – I begin writing to you at 7am. I am on the tube on my way to school. I am feeling pretty exhausted and anxious tomorrow is Chemotherapy round 4. I have had a bit of a cold this week which has made me feel pretty flat. Since my last round of treatment life has been crazy busy and I am realising that I can’t keep charging on in life like I am at 100%. The weird thing is up until getting this little sniffle I have felt so normal that I kind of took advantage. In the next few weeks its going to be rest rest rest and teaching. There have been lots of catch up’s and outings….lunch dates with Jacque, Sarah’s birthday dinner, Haley’s farewell with a trip to the theatre to see the Lion King, made it to Buckingham Palace which was just AMAZE…..its only open to the public between July and September so if you are in London ever at those times then you definitely need to check it out. Finally got to see the amazing show West Side Story. I saw most of it in between shutting my eyes for a few scenes. Disgraceful. The parts I did see were fantastic. May have to go again…..
I’ve moved house again. This time I’m back up between Turnpike Lane and Manor House (on the Piccadilly Line) which was where I was with Kate when I first got to London. I love our little palace. Its so nice to be in a place that is clean and the shower has mint temperature and water comes out evenly in every hole in the shower head. So good for my twice a day baldy fuzzy wuzzy head massages! Being back at work has been great and we are in Week 4 of the school year. They boys are generally pretty good but are super chatty and if I don’t engage them quickly I struggle to grasp their attention. The activities have to be set out in tiny bite sized bits or I get bombarded with questions and paper shoved in my face. I think over the next couple of weeks they will settle a little bit im so over being yelly. The staff are really friendly and the lunches are fantastic. This week we had a whole school photograph so if you can visualize 1400 people all together on a tiered platform then there you go. Pretty cool to be apart of that. The school photo was taken as apart of the 150th year celebrations. Thursday afternoon….Blood tests are my new most loathed thing. My veins are being absolutely impossible at the moment and I am soooo over being a pin cushion. Went for a blood test before chemo (every round I have to have my white cell count checked) and both arms were stabbed a couple of times. In the end I was like take it from my wrist. That is where I have a massive vein that sticks out. Only problem is that its right on the bone. By the time they finally managed to draw some blood it was only trickling out. Not pulsing like it normally does. So much for multiple bottles of water and peeing like a race horse all day! I was a bit concerned about my blood results due to my cold but at my appointment with the Oncologist he said these results are completely normal….You’re as strong as an Ox! Haha as you could imagine that made my day. He however wasn’t that impressed when I told him that I am meant to be doing a half marathon this weekend……Crazy?…..YES! So…..I am writing this in bits. I am back on the tube and it’s Tuesday morning – 1st October, 2013. Chemo number 4 was pretty straightforward even though I was really not in the mood. Just flat. Once I got there it was good. 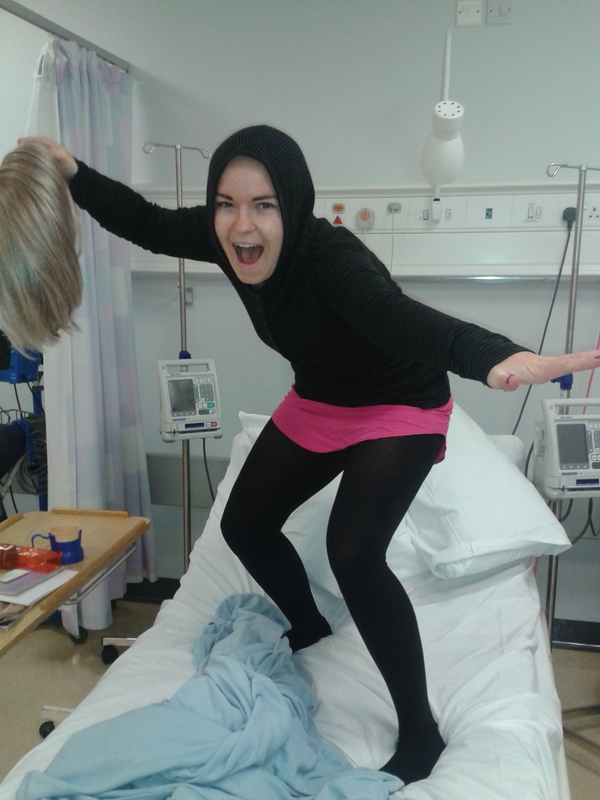 It was quiet again so I was back in a bed and Kate turned up at about 4pm. Home for a yum dinner of chicken nibbles, pizza, salad and chocolate milk. Random but so good! I was rummaging through one of my drawers and came across these wrist bands that have pressure point plastic domes on them. They are called “Sea Bands” and are to combat sea sickness but can be used for chemotherapy too. I put them on and they worked a treat. Thanks Mira! I felt pretty tired so just went and laid in bed and waited for the spewy feeling to come on. It didn’t so was pretty happy about that. I kinda felt like I needed to but no such luck with the vomitron this time. Good sleep and felt good on Saturday morning ready for the half marathon! On Friday night it was obvious that this round had effected my hair again. Fuzzy Wuzzy was falling out and was all over my pillow and in my tea! Yuck. 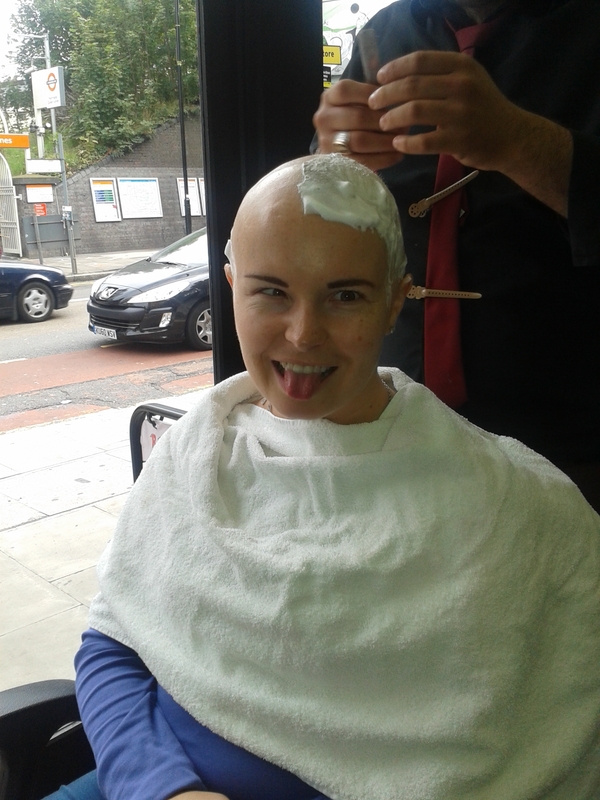 I decided to go to a Turkish barber on Saturday morning and get a Cut Throat head shave. It was so nice to have it all off again. It had grown back a bit since I got it buzz cut but was super patchy and I looked a little bit like a mole! Haha. It was a cool experience and I had Imogen and her mum Margie there as support and photography crew. Something I will probably never do again but ticked it off the bucket list. Now though I have a sandpaper head……feels weird! The Shine Half Marathon was a great experience. 16,000 people participated across the half and full. There was such an wide range of people doing it all with different stories and connections to cancer. Its a sobering that know that so many people are affected by this disease. There are so many different kinds of cancer and not one is the same. 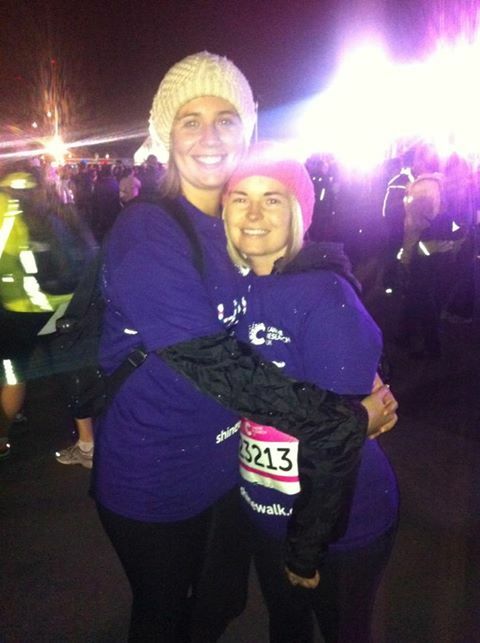 It was great to have Sarah there to do this walk with and I am so proud of her for doing it as I am sure her Mum is. Sarah lost her Mum to Breast Cancer. Imogen and Danieka were there too which was great. We managed to get through in 4hours 7minutes and 30seconds. It was a bit rainy and windy at times but it was ok the power walking kept us pretty warm. Had a mental health day Monday. Needed a day off to just get myself a bit more organised with school and life like changing doctors again and sorting out my tax code. Fun times. Off to Rock of Ages tonight with Sarah and Kate so looking forward to that then the rest of the week is filled up with appointments. Out for dinner first. Pizza and heaps of power ballad singing. Definitely a must see!!! Was brilliant. Got an Echocardiogram (Heart Scan) tomorrow after school. The Oncologist is doing this at the half way point of my treatment just to make sure my heart is coping with chemotherapy. Precautionary at best really. Seeing a surgeon on Thursday afternoon regarding getting a portocath put in. Heart scan results came back good and I will be on the surgical list to get the port put in next week. No hair! I still have eyebrows and eyelashes which I am happy about but I am certainly not shaving my legs or armpits which is just amazing because I am usually super furry. Definitely saving plenty of moolah on waxing my bum! Stoked. No more haircuts, dye jobs or buying unnecessary hair products savings account will be on fine form soon. No pimples. The steroids I am on for anti-sickness/ anti-nausea are doing wonders for my skin. I have even put weight on which is good as the steroids speed you up so much you burn more energy therefore have to refuel more. I’m glad I am still able to eat what I like when I want and my taste buds this round have not been too effected. I lie….last night I had to put chilli and tomato sauce in vegetable soup because it had no taste……It is all so spiratic.The stink parts…….The aches are certainly a downside (the feeling of being bruised all over). Swelling up, fluid retention is dramatic. When I was doing the half marathon I could get my rings off my fingers were so fat. I blow up from time to time and no that is no permission to joke about my ego. Thank you very much for laughing. The tiredness is certainly catching up on me. Feeling pretty exhausted at the end of the day and have to kip on the tube. Waking up at 3am with a stupid song in my head (Dumb Ways to Die) and not being able to get back to sleep because I am so high on steroids……it’s annoying. Waking up sweating like no tomorrow but not really that hot so odd. So many random feelings and body experiences. So I am busy and well. Just aiming to be a bit more chilled over the next couple of months and just really take it easy. London is great as there is always something to do and look forward to. Having our house warming on the 12th of October and 2 weeks till Mum is here. Have just booked Portugal for Xmas with the girls so that’s going to be just wonderful. Another thing to look forward to is doing a tour of Disused London Underground Stations. Fun fun fun. Chemotherapy Round 4. Half way there!!! Friday 27th September, 2013. See ya later Fuzzy Wuzzy! Now for some Sandpaper Head! Shine for Cancer Research UK – Half Marathon. This was taken pre-race. We did it in 4hours, 7minutes and 30seconds…..Mint effort. We raised almost 800GBP between us.